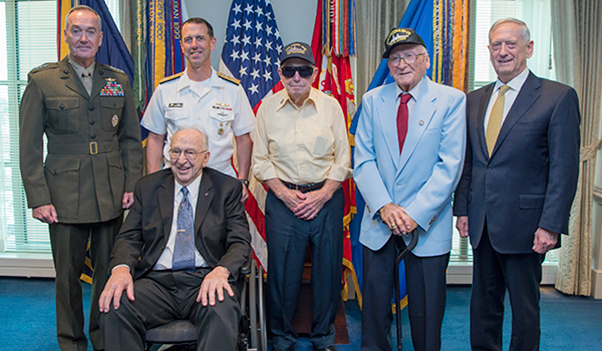 Survivors from the USS Arizona meet with military leaders at the Pentagon in Washington, D.C., July 21, 2017. From left to right are U.S. Marine Gen. Joseph Dunford, Chairman of the Joint Chiefs of Staff; U.S. Navy Adm. John Richardson, Chief of Naval Operations; Lauren Bruner, who served as a fire controlman third class; Ken Potts, who served as a coxswain; Donald Stratton, who served as a seaman first class; and Secretary of Defense Jim Mattis. Americans are keenly aware of the events that happened on Dec. 7, 1941 — the day the Japanese bombed Pearl Harbor, which thrust the U.S. into World War II. 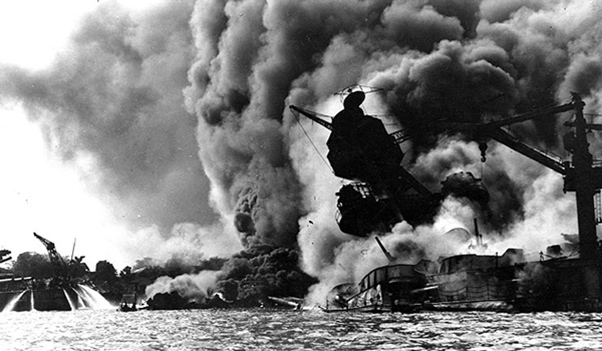 One of biggest tragedies that day was the sinking of the USS Arizona, which took the lives of more than 1,000 men. 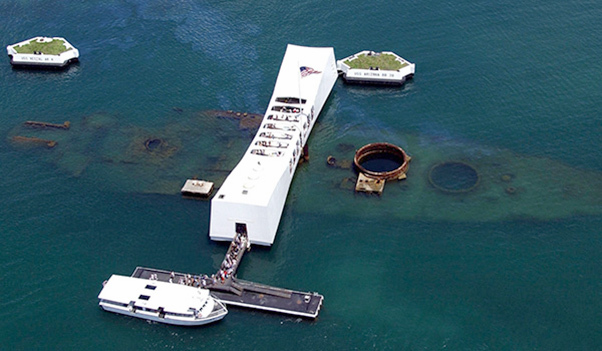 To this day, the remains of the USS Arizona can be seen from the sacred Pearl Harbor memorial built in memory of the 945 men who remain entombed there. Last week, three of the ship’s remaining five survivors were brought to the Pentagon to honor a fellow sailor who saved their lives that day. Navy Fire Controlman 3rd Class Lauren Bruner, Seaman 1st Class Donald Stratton, and Coxswain Howard Potts came to Washington, D.C., to posthumously honor Boatswain’s Mate 2nd Class Joe George. They wouldn’t be alive without him. Donald Stratton, a Nebraska native, enlisted in the Navy in 1940, just after graduating high school. In December of that year, he reported for duty on the USS Arizona. Shortly after 7 a.m. on Dec. 7, 1941, Stratton was leaving the mess hall when he heard a lot of yelling and saw planes with the Rising Sun insignia on their wings. Then bombs began exploding all around. 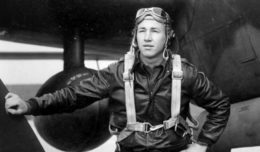 He quickly headed for his battle station one deck above the bridge, where he and fellow sailors tried in vain to fire back at the high-altitude bombers. The USS Arizona burns after being hit by a Japanese bomb while U.S. sailors aboard the neighboring USS Tennessee spray fire hoses to force burning oil away from their ship during the air attack on Pearl Harbor, Hawaii, Dec. 7, 1941. Around 8 a.m., the Arizona was hit by three bombs, the third of which sliced through the starboard side, igniting over 1,000,000 pounds of ammunition and fuel. For a split second, the ship lifted nearly completely out of the water. Then a fireball erupted more than 500 feet into the air. Stratton attempted to shield himself from the raging inferno. As he did, he saw two of his shipmates jump overboard. They were never seen again. Stratton stayed put and suffered burns on nearly 70 percent of his body, from his ankles to the top of his head. At one point, he had to remove the burnt skin from his arms, pulling it off like a sock. His hair was gone, and part of his ear was missing when Fire Controlman 3rd Class Lauren Bruner found him. Bruner, Stratton and four other sailors who converged on the same area were able to signal to Joe George, a boatswain’s mate on the nearby USS Vestal. Ignoring orders, George threw the men a line that they were able to secure across the two ships. The six stranded sailors then crossed about 70 feet of burning water 40 feet in the air to reach safety. Two of the men died on the Vestal waiting for rescue, but Stratton and Bruner survived. Stratton spent three weeks at a local hospital before being sent back to the mainland, where arrived on Christmas Day. He spent the next nine months at a hospital. * He weighed 170 pounds before the attack. Once he was released from his hospital stays, he weighed only 92. * Determined to use his battered arms again, he refused to have his left arm amputated. After a year, he regained almost full use of his left side and was medically discharged from the Navy in September 1944. * Since World War II continued, Stratton reenlisted. The Navy refused him at first, due to his medical history, but he was eventually allowed to return – only if he went through boot camp again. * After his second stint in boot camp, Stratton was assigned to USS Stack and took part in the Pacific invasions of New Guinea, Hallamahara, Leyte, Luzon and Okinawa. An aerial view of the USS Arizona Memorial with a US Navy Tour Boat, USS Arizona Memorial Detachment, moored at the pier as visitor disembark to visit and pay their respects to the sailors and Marines who lost their lives during the attack on Pearl Harbor on Dec. 7, 1941. Bruner was born in 1920 in Washington State and enlisted in the Navy when he turned 18. By 1939, he was serving as a fire controlman on the Arizona. During the first wave of attacks on Pearl Harbor, Bruner was standing at his battle station and was thrown towards the back deck, as other sailors were thrown overboard. He was able to regain his footing and find fellow survivor, Stratton. As explained above, they both managed to escape to the Vestal. In 1942, after a stay on the hospital ship USS Solace, Bruner was transferred to a mainland hospital. Once he recovered, he was assigned to the USS Coghlan and the USS Duluth and participated in eight major engagements in the Aleutian Islands and seven South Pacific operations. He retired from the Navy in 1947. Ken Potts joined the Navy in 1939, and by the end of the year, he was reporting to the USS Arizona. Luckily for him, Potts was on shore loading a boat with fresh produce for the Arizona’s storerooms when the attack began. He witnessed the massive armor-piercing bomb strike the forward deck and explode. Potts quickly dumped the produce into the harbor, then drove the boat directly to the fire-engulfed ship. 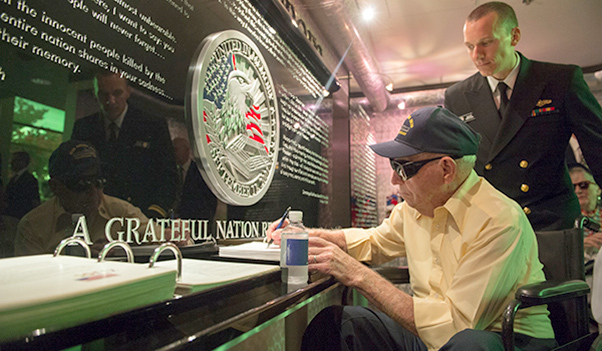 USS Arizona survivor Navy Coxswain Howard “Ken” Potts signs the guestbook at the Pentagon. Potts climbed aboard, ducking to avoid being hit by dive-bombing planes. He directed sailors to his boat and carried others, getting them to refuge of Ford Island. After the attack, he helped in the recovery of his shipmate’s bodies. Potts was later assigned to a tanker that made short runs outside of Pearl Harbor to refuel ships. He also worked for the Port Director’s office, delivering sealed packets, new orders, military secrets and other classified information to Navy captains around Pearl Harbor. Potts retired from the Navy in 1946, settling for small-town life in Utah.